To some, the news this week that CNN Worldwide is cutting 8.5% of its workforce at the same time that it is enjoying a healthy, double-digit profit margin might seem confusing. The original – and largest – 24-hour news channel is in many ways faring just fine financially. But a closer look at CNN reveals a larger problem, with cable news business struggling to find its feet in a shifting media landscape where its audience is not matching up with revenue trends. In terms of TV viewership, cable news peaked as a medium around the 2008 presidential election and, while showing impressive potential in digital, the business model is uncertain. Over the past year (January-September 2014 compared with the same period in 2013), CNN’s prime-time audience has declined by a quarter to a median viewership of 495,000, according to Nielsen Media Research data. During the day, the channel has fared better, but is still down 4% over 2013 levels. Along with declining viewership, research firm SNL Kagan projects that CNN will experience a dip in advertising revenue of about 5% to $302 million. But CNN isn’t alone. 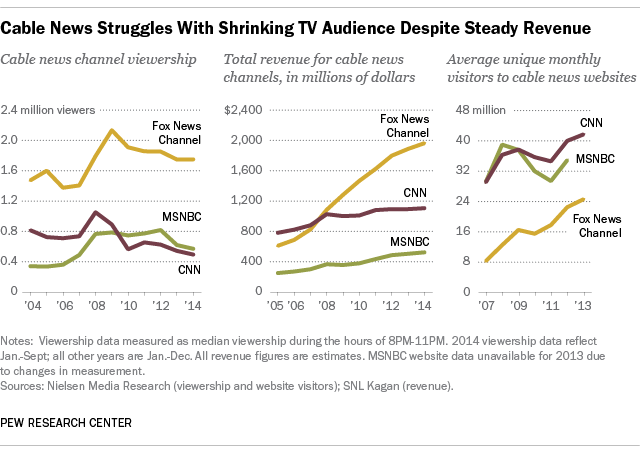 All three major cable news channels have seen their audiences decline in recent years. MSNBC’s prime-time viewership has declined 4% over the same period in 2013, and 17% during the day. Fox News Channel, while growing slightly in prime time (2%), has lost 5% of its daytime audience. The total prime-time audience for the three channels combined, hovering at around 2.8 million viewers, amounts to just a fraction of the more than 20 million people who tune in to one of the three commercial news broadcasts airing on NBC, ABC and CBS each night. And yet, business — by and large — is still good. Profit margins continue to be staggeringly high, between 30% and 55%, thanks to the cable system’s dual-stream business model. The news channels generate revenue from both advertising and license fees, which they receive from cable companies in exchange for carriage in households. Individual channels regularly renegotiate those fee rates upward, resulting in business growth even if advertising falters. For 2014, projections show slight gains in total revenue for each of the news channels — 1% for CNN, 4% for Fox and 4% for MSNBC. There are some signs that the cable TV business model is headed for disruption. The number of Americans (around 100 million) who pay for some form of pay TV, including cable, fell for the first time in 2013. Meanwhile, eMarketer forecasts robust growth in digital TV viewership on a variety of devices. As news habits and technology adoption continue to become more digital, cable news outlets are thinking beyond the main screen. By this measure, CNN’s digital operation is leading: It had 42 million unique monthly visitors in 2013, according to Nielsen — two-thirds greater than that of Fox News (25 million). Digital may not yet be where the money is at; CNN Worldwide has said at one point that it accounts for about 10% of its total revenue. But the company is showing that it’s keeping pace with where the audience is going.